We do not curently have theatre tickets available for Showstopper! The Improvised Musical. This could be because we have simply sold out or it could be that this show is no longer running. The information on this page remains purely for historical and informational purposes. 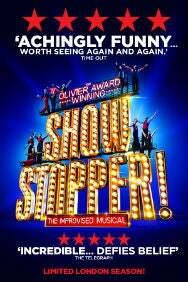 The Showstoppers transform audience suggestions - for setting, musical styles, show title and more - into all-singing, all-dancing productions with hilarious results. Come watch an entirely different show every single night! Guaranteed to impress, they create shows packed with high drama, superb lyrics, dazzling dance routines and catchy melodies  it’s just entirely made up on the spot! Every Showstopper! performance is a brand-new musical West End hit waiting to happen  so don’t miss out!